Fifty years ago Pal Benko received a double billing for placing first in two strong open tournaments. 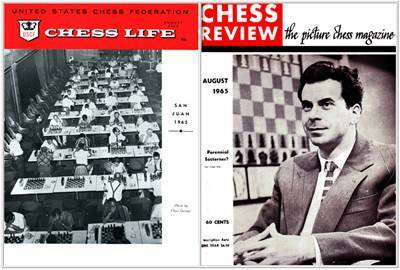 If his photo on the Chess Review cover looks familiar, the same photo was also seen for the October 1964 'On the Cover'. Benko, Lombardy Tie in U.S. Open  GMs Pal Benko and William Lombardy tied for first in the 1965 U.S.Open, played in San Juan, Puerto Rico. In accordance with USCF regulations in effect since 1963, they were proclaimed co-champions. Pal Benko, former Hungarian and New Yorker, mops up regional tournaments regularly, mainly in the East. With his second Eastern Open title (the first was in 1962), he bids to become a perennial Easterner. On the page announcing the result of the U.S.Open, Chess Life carried an obituary for a little-known, yet important benefactor of American chess. E. Forry Laucks  Players at the United States Open were shocked and saddened by the sudden death of E. Forry Laucks on Saturday evening, July 31. Mr. Laucks, a participant in the Open, had played the first six rounds and seemed to be in good health and spirits. Accompanying a large group of chessplayers on a tour of San Juan, he collapsed suddenly and was pronounced dead upon his arrival at a nearby hospital. Mr. Laucks, a Life Director of the USCF, was most famous as the founder and patron of the Log Cabin Chess Club. This unique chess organization, found. in 1934, was located at 30 Collamore Terrace, West Orange, NJ., and was visited by thousands of players -- including all the outstanding American masters. Hospitality at the Log Cabin was proverbial; proverbial also were the many chess trips and excursions that Mr. Laucks and the club members made to many points in the United States, Canada, Central America, Cuba, and Europe. In 1958 alone, the club sent representatives to eleven countries. The Log Cabin played for many years in the Metropolitan Chess League in New York City and in 1945 won the league championship. From August 7 to August 22, 1959 the club was the scene of one of the greatest master tournaments ever held in this country -- the United States Seeded Championship. This event, held in celebration of the club's Silver Anniversary, was limited to ten of the strongest players in the nation. William Lombardy was the winner, followed by Benko, Bisguier, and Robert Byrne. Mr. Laucks provided an unusually generous prize fund: first prize was $1200, second $1000, with the others in proportion. Play was held at the Log Cabin and at Mary Bain's Chess Studio in New York City. Although the Log Cabin had not been as active in the last few years as previously, Mr. Laucks had lost none of his enthusiasm for chess promotion. Only a few days before his death, he was outlining plans for more "firsts" and spoke enthusiastically of future tournaments and matches. For more than thirty years E. Forry Laucks was a generous chess patron, an energetic chess promoter, and a colorful and well-beloved figure at chess gatherings everywhere. It will be hard to imagine a U. S. Open without him. For more about Laucks, especially his influence on young Bobby Fischer, see Elliott Forry Laucks on Chessgames.com.